Whether you’ve spent hours making batches of cupcakes, or you’re a witness to those extreme sugar rushes (and crashes) when your child gets home from school, we all know about the poor quality of food being served to children during class parties. So why hasn’t anything been done about it? Why do schools allow junk food at class parties? This is a becoming a very common question as parents become more health-conscious and careful about what they feed to their children. Rest assured, the teachers are not out to ruin your child’s health. With their time-crunched schedules, they probably haven’t even considered the other possibilities. Class parties are usually steeped in tradition (“We’ve always done it this way”), and let’s face it, junk food is cheap and easy, plus the kids seem to love it (much to our chagrin)! The traditional way of thinking is, “It’s just a party. It doesn’t happen every day. It’s only a cupcake. What’s the harm?” But there is harm. Junk food is high in calories but very low in nutritional value, if any. 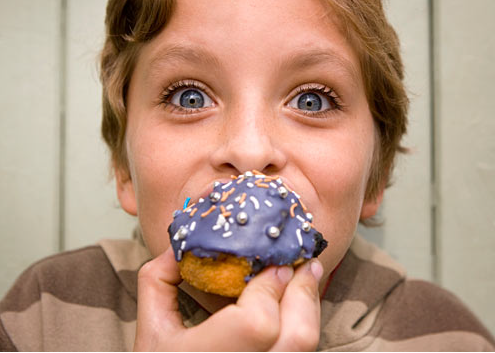 Unhealthy food choices are no longer the exception, they are the norm. Most children do not eat enough fruits, vegetables & whole grains. Plus, having a class party involving food after the kids have already eaten lunch teaches kids to eat when they’re not really hungry. Offer to help plan the party. No one likes the Negative Nancy who only complains about the problem but does nothing to help fix it. Your direct involvement can steer things in a healthier direction. Voice your concern in a non-judgmental way. Recruit support from other parents. Propose a completely different kind of party than one centered on food. you could have on the entire school. For more ideas on Healthy Celebrations, visit www.TxPTA.org. Paige Balius currently serves as the Healthy Lifestyles Chair for the Round Rock ISD Council of PTAs. She works as an advocate to promote recess, physical education, and good nutrition in the schools. As a personal trainer and mother, she believes that healthy habits start in the home. A self-described exercise enthusiast “late bloomer”, she believes everyone can find an exercise they enjoy and makes it her mission to help them find it!